MLK I Have a Dream Speech: What was it like to work with Dr. King? What Was It Like to Work With Martin Luther King Jr. on the “I Have a Dream” Speech? 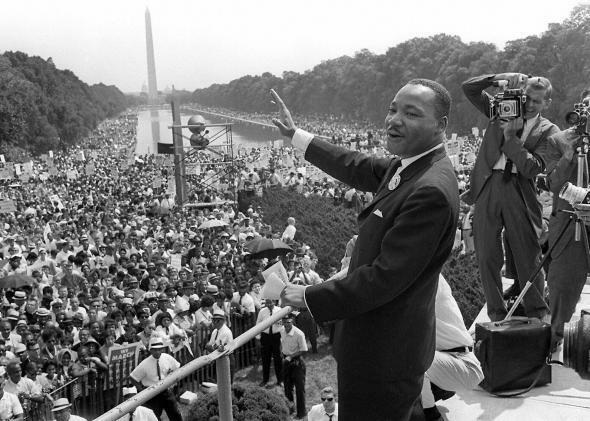 Martin Luther King Jr. waves to supporters from the Lincoln Memorial on Aug. 28, 1963, in Washington during the March on Washington, where King delivered his “I Have a Dream” speech. It is a popular misconception to think that Martin Luther King Jr. sat down with me one day and said, “OK, Clarence, let’s work on this speech I have to give at the March on Washington.” In June 1963, when the joint civil rights organizations made the decision to convene the March on Washington, the decision was also made that King should vacation in New York instead of elsewhere, as he customarily did with his family during the summer. During this five-week period we would sometimes talk about the content of what he should consider talking about in his speech. After he left his “vacation home” in late July and returned to Atlanta, several peeople began to offer him suggestions as to what he should say during his speech at the march. The closest we came to “sitting down to work on the speech” was when we were both staying at the Willard Hotel on Aug. 27, 1963, the day before the march. During a brief time during that evening, I and others had an opportunity to speak with him for about an hour in a secluded corner in the lobby of the hotel. I handed him my handwritten notes summarizing issues we had previously discussed in July in person and in early August over the phone. The notes included suggested text of the opening paragraphs he might consider using in the speech. This was not unusual, since at different times Stanley Levison or I would often, at his request, provide drafts of texts of various speeches or articles he might be writing. But let me make it clear: All of King’s speeches during those limited years I was privileged to assist him with were his speeches, not mine nor Levison’s. Until I actually heard the words spoken by him at the March on Washington, I did not know what he had decided to use as his opening paragraphs or whether he would use the text that I had suggested he consider using. As spoken by him, they were his words, not mine. Martin Luther King, Jr.: What was it like to hear the “I Have a Dream” speech on August 28, 1963? African-American History: Why did the American South import slaves from Africa rather than Europe? Martin Luther King, Jr.: What would Martin Luther King Jr. have thought of the events in Ferguson and all of the subsequent related events?